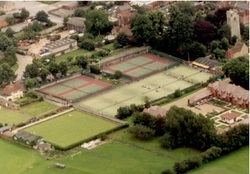 SSLTC has nine outdoor courts – seven are all weather artificial “grass” courts and two are artificial clay. All courts are floodlit and bookable online by members. The two Euroclay courts with floodlights were completed in November 2014 with a double skin air dome providing indoor tennis between November and March each winter. In 2006 we opened our new permanent clubhouse. Located in the centre of the club's courts, it really has become the heart of the club with the upstairs viewing gallery commanding great views of all courts. The clubhouse of course has a smart kitchen, changing rooms, professional's office and large club room. Upstairs there is a second large club room that is used for cardio training, wet weather refuge, table tennis, meetings and chilling area for juniors.